Sciblogs | Who’s been ‘buying up’ New Zealand? Who’s been ‘buying up’ New Zealand? There’s a huge interest in foreign investment in New Zealand – it’s front page news when Chinese investors aren’t allowed to buy farms, or Asian investors are supposedly snapping up Auckland houses, and the piece I wrote about Statistics NZ’s data on foreign direct investment has had by far the biggest number of pageviews of anything I’ve written recently. Yeah, yeah, yeah, I know, they’re not Krugmanesque numbers, but still. Yesterday Stats released an update to the numbers, showing the situation at the end of March ’15 (the spreadsheet with the numbers is here). 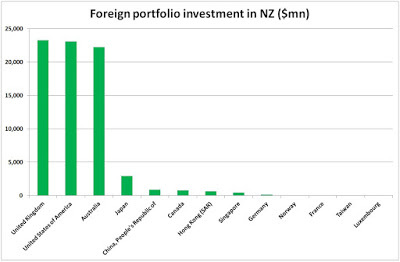 First, here’s the total stock of foreign direct investment in New Zealand, which includes the likes of those farms. One country overshadows everybody else. 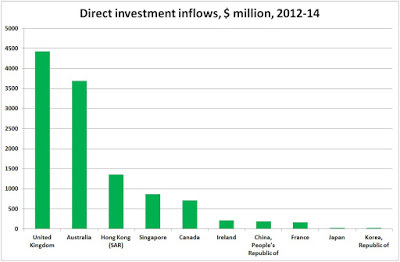 Australia has more invested here ($51.4 billion) than the rest of the world put together ($48.2 billion). There are bite-sized chunks from the US, Hong Kong, the UK and a range of other Asian and European countries, but the story starts and ends with Australia. Most of Australia’s interest is the banks: I don’t have a complete industry-by-country breakdown, but given that there’s $32.1 billion of overseas investment in our ‘financial and insurance services’ sector, and that by far the bulk of that will be the Aussie-owned banks, you can say that about 60% of all Australian investment is in the finance industry. And what about all those farms being sold out from under the feet of our own farmers? Nah. Total FDI in ‘agriculture, forestry and fishing’ is $5.9 billion, a small proportion (5.9%) of the total investment, and roughly on a par with foreign investment in the retail trade ($5.7 billion). It’s also a very small proportion of the total value of farms and forests, which at a heroic guess (as I’m no expert on the data in this neck of the woods) I put at around $340 billion. That’s 14.4 million hectares (2012 Agricultural Census, here) times an average price these days of some US$15,000 a hectare (which I got from this article), or NZ$23,500 or so at today’s exchange rate. So roughly only 1.7% of agriculture is owned overseas, and of that I’d guess a fair slab is foreign institutional fund ownership of forests. The proportion of the archetypal family-run sheep and beef or dairy farms owned by overseas interests must be very small indeed. For those who might be agitated that we’re all in hock to the People’s Bank of China, that doesn’t show up, either. Here’s the picture of total foreign portfolio investment – everything from government stock to listed shares to unlisted equity to money lent to New Zealand entities. Essentially it’s the UK, the US and Australia, with roughly equal amounts, and there’s a modest bit from Japan. Everything else is relatively insignificant.